Our Financial Calculators include a Euro (€) to Peso ($) Converter. 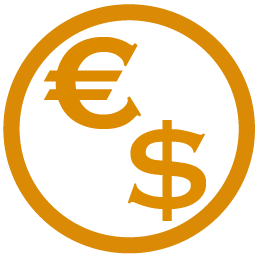 With the free Currency Converters, calculate the Exchange Rate from Euros to Pesos now. Our fast, easy-to-use, free Currency Converters make up part of our collection of Finance Calculators. Have a glance at any of our Currency Calculators to find out the current foreign exchange rate between Euros, Dollars, Yen, the Peso and the Pound (Sterling). The Euro-Peso Converter simply requires you to fill in a value for conversion and click the calculate button. The free Currency Converter does the rest and will immediately display the converted amount in your chosen unit of currency (Mexican Pesos or Euros) depending on which conversion you specified beforehand. Is the Currency Converter updated? All of our Currency Converters automatically update every day. To provide the most up-to-date and accurate currency conversion between Euros and Pesos according to the current market value, the Euro-Peso Currency Converter uses the latest Foreign Exchange Rates.